It is the second consecutive year and third time in the past four years that the 111-footer has won the trophy at the seventh annual regatta. 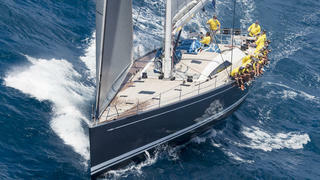 Built by Baltic Yachts, Nilaya won all three races in Class A by an average of more than 6 minutes. “It comes down to good management and, of course, a great owner,” said tactician Bouwe Bekking. “Without a great owner you can’t put a good team together and he puts a lot of emphasis on good team work. It’s a combination of a couple of pros, a lot of friends, and a lot of history; we’ve been sailing together for nearly seven years now. Nilaya also won the Loro Piana Cup for winning Class A, as did the 38m P2 in Class B, the Swan 90 Freya in Class C and the 60m Perseus 3 in Class D.
With a brisk wind of 13 to 20 knots propelling the 17 yachts around the 23-nautical-mile course set about the Sir Francis Drake Channel, P2 won its final race showdown with Ganesha to capture Class B. The two were tied on points heading into today’s finale, but the P2 crew signaled their intention to take no prisoners this morning when they fired their cannon—a 39-inch barrel, 2-inch bore armament that was captured from the French frigate Le Medee in 1801—upon leaving the YCCS dock. When they fired it again after finishing, everyone in ear shot knew the job had been done. Don MacPherson’s Freya also captured its second consecutive class victory and third in the last four years, winning all three races in Class C by an average of more than 5 minutes. For MacPherson and crew it was their fifth consecutive victory in the past year. 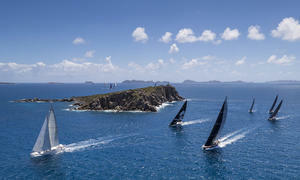 They started winning at last year’s Loro Piana Caribbean Superyacht Regatta, continued at the St. Barth’s Bucket last year, then won the Rolex Swan Cup last September in Sardinia and finally the Rolex Swan Cup last week in Virgin Gorda. 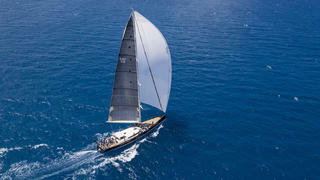 MacPherson is no different than Nilaya’s owner; there’s always a new sail to purchase. “The new sail this week was the yellow A2 spinnaker. I think it was a great sail for us. We sailed quite well downwind,” said MacPherson. 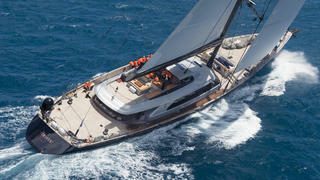 In Class D the 60m Perseus 3 completed its first class victory with a come-from-behind win. She suffered a problem with its roller furling system that prevented the crew from using the large headsail for half of the race’s upwind work. The crew was able to get the issue sorted out in time to score a 45-second win over Action, the new 123-footer from Dykstra Naval Architects and built by Royal Huisman. At the final awards Action, helmed by Olympic medalist Shirley Robertson with Volvo Ocean Race winner Ian Walker calling tactics, was presented the British Virgin Islands Trophy for best newcomer to the event. All winners were congratulated at the final awards presentation, signaling a fantastic end to another successful Loro Piana Caribbean Superyacht Regatta & Rendezvous. 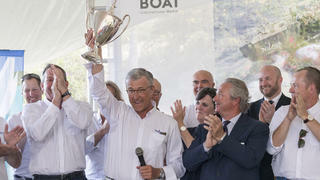 See more pictures from the regatta on the Boat International's Media Bank.